The lovely people over at Penningtons sent me a trench coat from their new spring arrivals, and since last week it was finally hitting spring-ish weather, I decided to take it out for a stroll. When they advertised the trench coat, they paired it with a really strong, professional black and white combination, so I decided to wear it as a more casual look with lighter colors. The trench is meant to be a rain coat, so it is made from a polyester-nylon blend, and although that’s not my favorite fabric in the world, it works perfectly for the purpose of the trench. I wore it with a print tank I had gotten from Torrid and some old jeans and flats (which need to be retired they’re so old and worn). The trench has a print lining, pictured below, and comes with a belt. I didn’t care for the clasp on the belt, so I went without, and I think it looks just fine without one but misses that “trench”-ness to it. A common problem I run into with long coats like this is that my hips are a size or two bigger than my top portion so the coat tends to have extra room up top and stretches to it’s max around my hips. This coat had the same issue. I don’t think the extra fabric up top is that apparent, but the tightness around my hips/bum was definitely there. That being said, there was still enough room for me to comfortably wear the coat even with the extra stretch. Also, I seem to have T-Rex arms, and my hands are always found swimming around a lot of fabric. I think I’ll have to have the sleeves shortened, but this jacket would suit people who are 5’5″ and up really well. 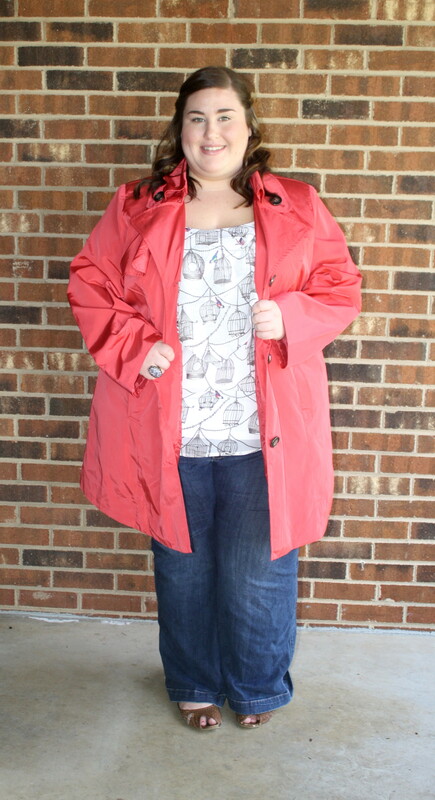 Ultimately, I’m really happy to have this trench in my closet. It has that perfect pop of color needed to carry me through spring-time rain storms. Because of the material, the trench favors certain body types for sure. If your hips are a size or more larger than your top, then purchase the coat according to your hip measurements. If you carry weight in the arms, this coat is probably the most comfortable and roomy I’ve ever found. 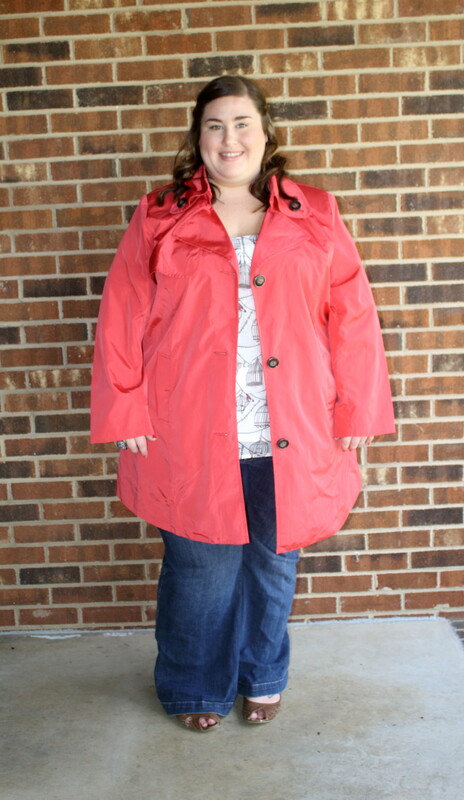 I know of a few other bloggers who were sent this trench, so keep an eye out for how other people style this coat. The options seem endless! That blue is a great bright color, and I can see myself slipping this on to go to school or out with friends. With the right accessories, it can be used to pull off so many different looks. What do you think of this colorful trench coat? Do you buy outerwear specifically for spring/rain? Penningtons gifted me this trench coat. It was my own decision to feature the item in a review, and I have expressed my honest opinion about the item. You definitely worded the style much better than me! I like that “feminine twist on utilitarian style” has a nice ring to it :). I think I would actually like canvas materal more, but that’s cause shiny fabrics tend to annoy me for some reason. I absolutely love this coat. I would scoop one up in an instant, but sadly I wear a 6X and they only make it up to a 4X. That is the thing I really hate about Penningtons…. I wish they had every item available in every size. So often I find lovely items, but they don’t carry them in the full range of sizes. To make matters worse, it is often the younger, fun styles which are not available to me so I am forced to select from the older fashions. I used to shop almost exclusively at Penningtons, but since I discovered so many other online retailers, I am now spending my hard earned cash elsewhere. I hope they change things, but I am not optimistic. 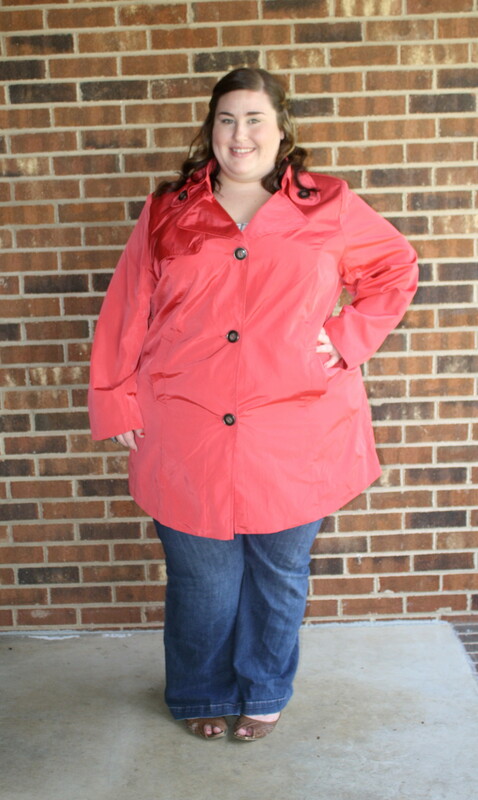 Rebecca, the trench, and those jeans, look amazing on you! Yea, that is definitely disappointing, and I hear you on that! I experience the same thing with Avenue and Lane Bryant. Thank goodness for online retailers! I love the shirt, such cute details and the coat is a really beautiful colour. Thanks, Dani! I just hope that spring actually comes and doesn’t skip straight to summer. So many more spring outfits in my mind! I love this outfit!! That trench is absolutely perfect. It’s such an amazing color. The styling is dead on, too. Thanks Cate! I find that coat shopping always takes me longer than other items. They have to be perfect! Great jacket in a great color, but for me, the star of the show is that awesome shirt! Thanks! 🙂 I wasn’t sure about it, honestly. Glad it has gotten good reviews! Considering all the rain we had today, it would have come in handy. yeah, it’s definitely going to come in handy for me! I’ve never bought a rain coat before, so I have no idea which retailers carry them besides Penningtons! Love the color on you! I totally understand what youre saying about the coat fitting great @ top but snug @ the hips. I struggle with that also. As usual you look great!!!! Gorgeous!!! I found a trench about that color marked down a ridiculous amount (London Fog) a while back, and I’m still kicking myself for not buying it. I LOVE the print on that shirt, too. So cute! Ahh! I hate when I think of “the item that got away”. Doesn’t happen to often because I’m a shopaholic :-X. Thanks for commenting, Andi! I love that color & I think you’re right about shortening the sleeves, after that it’s going to be perfect! i really love that shirt! 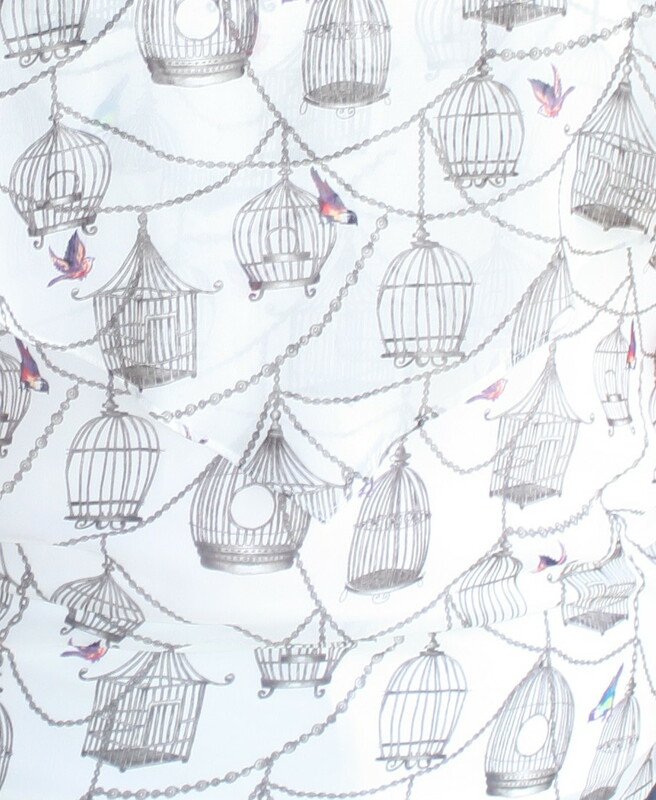 Where oh where did you get that birdcage top? I’m sorry if you mentioned it elsewhere… I am in looooove! Thanks! 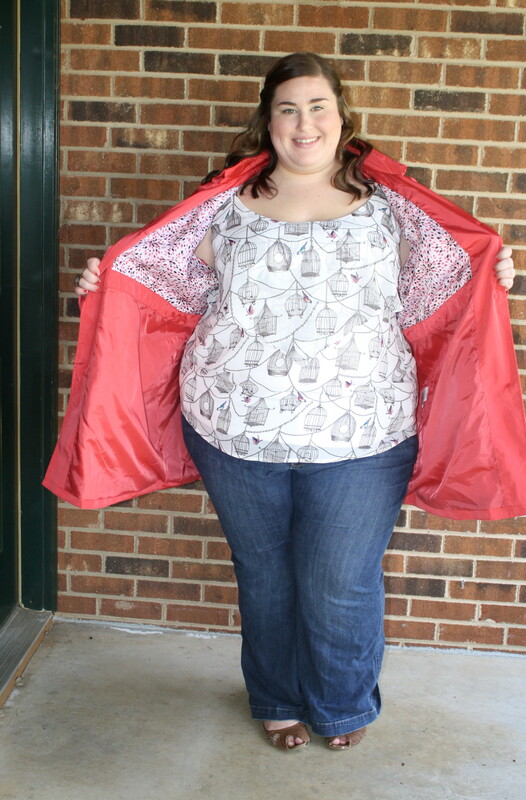 It was from Torrid!